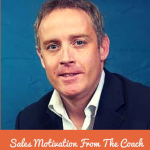 What do you think every salesperson needs to have to get things going in this highly competitive selling world? One word, ten letters, four syllables. In today’s episode, Vernon Foster II shares with us how you can get that fire burning and charge up for the daily hustle! 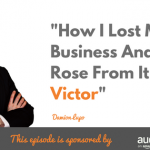 Vernon currently works with companies helping them launch podcasts, get their message out to the world, and build the know-like-trust factor through the podcasting medium. 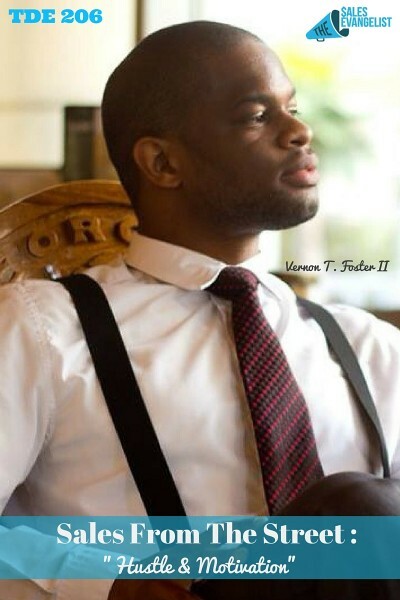 Having completed two college degrees (one in marketing and another in real estate), Vernon was ready to take on the world until he realized there wasn’t actually a lot of opportunities out there and got blindsided by the American Dream. How did he manage to get up, find his purpose, and live by that purpose each day? Let’s find out! Don’t depend on someone to be your sole provider. Be in the position to kill the meat and bring it home. If you don’t, no one else will. You are the sole provider and creator of your own destiny. Don’t expect others to fulfill that for you. Watch your inputs and outputs. Avoid watching the news which has negative stuff. Surround yourself with people at your level or above. That way you soak up the knowledge and swag in your life and it helps build your confidence. Start your day right with a personal daily ritual. Cultivate patience through meditation and gratitude. Vernon spends two hours each day meditating and keeps a gratitude journal where he writes three things he’s grateful for that happened the day before. Exercise even for a few minutes a day. Set income goals and prospecting goals. Set goals but also be flexible. Don’t beat yourself up if you don’t reach your goals. Instead, think about why you didn’t hit your goal and how you can do better. Don’t be afraid to go out there and drum up the business and live out your dream or purpose. You can’t depend on someone to be your sole provider. Set goals, be consistent, manage your expectations and the universe will provide what you’ve asked for. Come up with your personal daily ritual to cultivate the right mindset and trust in abundance.